"Dilwale" is an upcoming 2015 Indian Rom-com action movie directed by Rohit Shetty, and produced by Shah Rukh Khan's wife Gauri Khan under the banner of "Red Chillies Entertainment" and "Rohit Shetty Productions". The Film Music given by Pritam. The Film Star Cast includes Kajol as Meera, Kriti Sanon as Ishita, Shah Rukh Khan, Varun Dhawan as Veer, Boman Irani as King in Main lead roles with Vinod Khanna, Kabir Bedi, Varun Sharma, Chetna Pande, Johnny Lever, Sanjay Mishra, Mukesh Tiwari, ,Pankaj Tripathi, Nawab Shah and Shawar Ali in other supporting roles. The film is all set to release on 18.12.15. 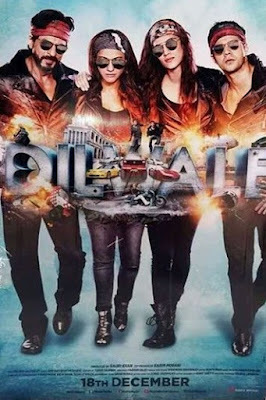 Watch Official Dilwale Movie Trailer featuring Kajol, Shah Rukh Khan, Varun Dhawan and Kriti Sanon at www.imslv.com in HD Quaity. Shayad tu Nahi janta ki, main kaun hoon? To kya main tera Aadhar Card Banau Be..
=> Also Check - Hate Story 3 Trailer here!